North Coast Community Transport cover all regions of the Causeway Coast & Glens council area and the Ballymena and surrounding areas of Mid and East Antrim council. Limavady is situated in the North West of Northern Ireland, bordering on Lough Foyle at its northern extremity. It is part of Causeway Coast & Glens borough council area. The area of operation consists of two main towns, Limavady and Dungiven. It also encompasses the ten rural wards of Magilligan, Aghanloo, Forest, Upper Glenshane, Feeny, Highlands, Glack, Greysteel, Ballykelly anf Roeside. The area has a total population of 31,855 living in a rural area of 58,635 hectares. The population density is 55 persons per sq. km., significantly lower than the Northern Ireland average of 125 persons per sq. km. Limavady has the fifth lowest rate of population density in Northern Ireland. The population in Limavady is predominantly rural, with the rural community representing approximately 63% of the population. Coleraine, part of Causeway Coast & Glens council area has a population of approximately 60,000 with half of the residents living in rural areas. Disposable income is well above the Northern Ireland average. Coleraine is the main town of the world famous Causeway Coast, which attracts over two million visitors per year, spending in excess of £37 million. Coleraine is situated at the lowest bridgeable point of the River Bann, where the river is a quarter of a mile wide. Coleraine is the major commercial centre in the North West of Northern Ireland and has been designated as a major growth area in the Northern Ireland Development Strategy. Rural areas include the smaller towns of Kilrea, Garvagh, Portrush and Portstewart. Ballymoney Borough covers 161 sq miles (41,700 hectares) and is predominantly rural in character. The town of Ballymoney is its administrative, commercial and educational centre, and there are a number of small villages in the rural hinterland. The Borough lies within the Antrim Coast and Glens Area of Outstanding Natural Beauty and also the Lower Bann valley, which forms part of the Borough’s western boundary. The area’s population has grown from 26,894 in 2001 to 29,741 in 2007 with one-third of the population of the borough living near or within the town of Ballymoney. The current population represents 1.7% of the population of Northern Ireland and since 2001 the borough has enjoyed a constant population growth rate of 1.7% per annum, (this rose to 1.8% 2006-2007), as a result of both positive natural change and a net inward migration to the borough. Moyle area is an entirely rural area with a population of 24,000. It has a population density of 0.24 persons per hectare, compared with the Northern Ireland average of 1.11 per hectare. Therefore, viable public transport in the Moyle area is most difficult. Moyle covers a large geographical area from Glenarm in the east to Bushmills in the west of the area. The area is characterised by Glens in the east and rolling countryside beyond the Glens to the west. The geographical area is large stretching over 600 square miles and includes 70 miles of coastline. The Borough, encompassing the five main urban settlements, Ahoghill, Broughshane, Cullybackey, Portglenone and Ballymena Town itself, together with several villages and hamlets, covers approximately 200 square miles, and has a central location within Northern Ireland. 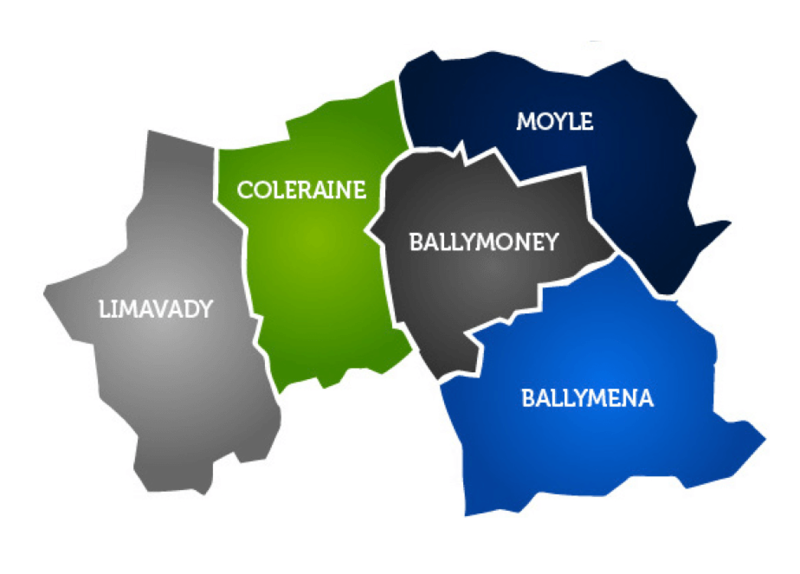 Ballymena is situated in County Antrim, where over half of the Borough’s total population of around 60,000 live in the actual town of Ballymena, The Antrim Coast and Giants Causeway bound the borough to the North, to the east by Slemish Mountain and Glens, to the west the River Bann and to the south by Lough Neagh. It is therefore also well placed to act as both a commuting and a holiday base.